Owatonna, MN, September 20, 2016: Building on the dependability, affordability and popularity of its Orbit-Air® line of pneumatic applicators for seeding, chemical and fertilizer applications, Gandy Company is pleased to offer the a 45 cu. ft. (approximately 36 bushels / 1,800 lb. granular chemical capacity), 12-volt drive, 24-outlet Orbit-Air® applicator with independent left and right discharge, rugged 8-GPM remote hydraulic blower, and assortment of metering wheels for small seeds and grains, plus granular chemicals. According to Randy Vargason, sales and marketing manager for Gandy Company, the 45 cu. ft. Orbit-Air® can be placed lengthwise on a vertical tillage tool so it can slide under folding wings and with its independent left and right discharge, tubing can be directed to each wing without unnecessary loops and bends. The 45 cu. ft. Orbit-Air® also includes a rugged 8-GPM remote hydraulic blower and 24-ft., of 4-inch duct tubing allowing the customer to conveniently mount the blower where space permits. “We know that operators are applying a variety of seeds and grains in cover crop applications” Vargason adds. 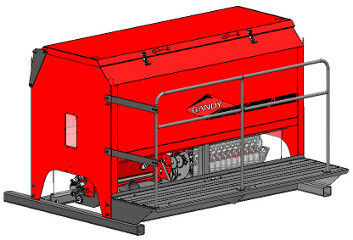 “That’s why the unit comes with our granular chemical and small seed black metering wheels suitable for alfalfa, rye, clover, radish, turnip, canola and other similar type seeds. Plus, we include our red metering wheels for applications of small grains such as oats, wheat, rice, barley, and much more. Our metering wheels can easily be interchanged in the field and this allows customers the flexibility they demand for virtually any seeding application without the extra expense of additional metering components. For precise rate application, a reliable Zero-Max® rate controller is included and can be accurately calibrated for nearly any field speed”. The 45 cu. ft. Orbit-Air® also includes slide closures for each metering wheel so the operator can independently close-off any outlet to use fewer outlets. For permanent installations requiring less than 24-outlets, blank plates are available to seal off metering and air outlets. Extra Mounting Equipment: User may need to provide additional tubing to mount hopper to parent implement to clear cylinders, leveling bars, etc. Deflectors, if ordered, may need to have mounting angle cut or altered to mount on parent implement.